So, you are interested in long jump shoes? They say the craftsman is only as good as his tools. And certainly having the correct tools for the job should make things easier. But is this saying true of something such as a pair of long jump spikes? Well let’s examine the evidence! When an athlete runs, with each step the body has to accept loads of up to 5 times their body weight. 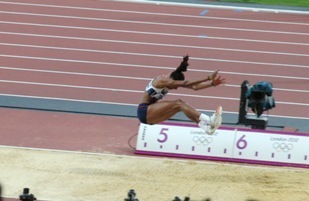 If that athlete is a jumper, then at the instance the foot is placed on the ground at take off, the ground reaction forces acting on their body is 8-10 times their body weight. You do the sums - if you are a 180 pound athlete (80kgs) that’s up to 1,800 pounds that must first be absorbed by the feet. This is the normal action of the foot as it goes through the stride gait, and is referred to as pronation. It is the body’s way of absorbing forces. However, depending on the height of the arch of your foot, you can have a foot that over-pronate or supinate. Either one of the two variables will increase your risk of foot injury when you take off. Your long jump shoe should be made of materials that are light, yet still provide the strength to withstand two ton of force going through it. You certainly don’t want to feel like you are wearing army boots as you are running down the long jump runway. A good pair of shoes will have a layer of support which runs the length of the shoe. This mid-sole, controls the torque action under the arch of the foot which is caused by the normal action of pronation when your foot is placed on the ground. Mid-sole supports are normally made from synthetic compounds such as EVA. A balance need to be struck between the compound being soft enough to give comfort absorb forces yet stiff enough to store kinetic energy which help the athlete get into the air. For this reason I normally recommend to the athletes I work with that they have two pair of jumping spikes, one for training which has a mid-sole with more absorption properties and the other for competition – with a stiffer mid-sole. As the long jumper places their foot on the ground for take off, contact is made with the ground with the heel ahead of the body. Depending on the jumping surface or the efficiency of the take off action the foot can sometimes slip forward at take off. 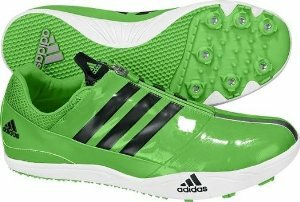 Your long jump shoes therefore need to have an outer sole that is grippy. We have already established that the normal foot action when it is placed on the ground is to pronate. Imagine now that action when the body is traveling at 20 miles an hour. At this speed and the weight of the athlete, a normal pronating foot now becomes over-pronated at impact with the ground. Without stiff heel supports there is an increased potential for the heel of the athlete to go beyond the support of the sole of the shoe and make contact with the ground itself. This is how bruised heels are sometimes caused. Long jump shoes with strong heel support limit the pronation of the foot and minimize the risk of injury to the athlete. Studies have shown that a dorsi-flexed foot increase the energy storage of the achilles tendon and so increase muscle recruitment and improve the power production of the calf muscle. By designing the shoes so that the achilles tendon is already pre-stretched means that long jump shoes are designed not only to make jumping more safe for the athlete but also to help the athlete jump further. I hope this article helps you in making the right choice in the selection of your long jump shoes. From "Long Jump Shoes - Making the Right Choice" Back To "Faster, Stronger, Better – Your Shortcut To Improved Athletic Performance"